The global Diagnostic ECG Market is estimated to reach $5,435 million by 2020 at a high CAGR during the forecast period. The factors driving this market include the increasing geriatric population, rising incidences of lifestyle diseases, technological advancements in diagnostic ECG devices, and high growth rate in developing countries. The factors restraining this market include the unstable reimbursement regulations, economic instability, and market saturation in the developed countries. The global diagnostic ECG market by product is divided into three major segments, namely, resting system, stress system, and Holter monitor system. In 2013, the resting system segment was the leading market segment. The resting system ECG market captured the largest market share in 2013 while the Holter monitor system ECG will grow at a fast pace in the forecast period. In terms of lead type the global market is categorized as single-lead, 3-6 lead, 12 lead. The 3-6 lead segment accounted for the largest market share in 2013, followed by 12 lead. The 3-6 lead segment is expected to attain the leadership position in the forecast period. North America commanded the largest share in the diagnostic ECG market in 2013 and is expected to grow from 2013 to 2020, at a high CAGR. The primary growth driver for North America is the extending population size of the elderly and the rising lifestyle diseases. Europe accounted for the second largest market share in 2013. In the forecast period, the growth of the European region will be slow due to the sluggish economic growth in the region. Asia-Pacific (APAC), on the other hand, will be the main focus of the market in the coming five years that will register high growth rates for all the segments. The global diagnostic electrocardiograph (ECG) market is segmented into three major segments, namely, holter monitor, resting, and stress type diagnostic ECG devices. The overall market was valued at $3,683 million in 2013 and is poised to grow at a CAGR of 5.7% by 2020. The market is driven by the rise in geriatric population, growing incidences of lifestyle diseases, and technological advancements. However, the decline of reimbursement policies will restrain the growth of this market to an extent. 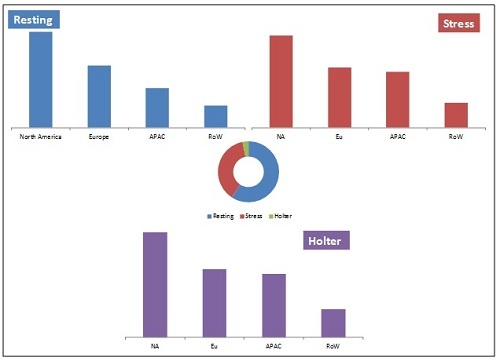 The holter monitor ECG devices will be the most fruitful segment for the companies to invest in the coming years. The resting ECG devices segment was the leading segment owing to the expanding geriatric population and growing incidences of cardiac diseases and other lifestyle diseases such as diabetes and hypertension. The holter diagnostic ECG device on the other hand was the fastest growing segment and is expected to grow at a healthy pace in the coming years, driven by the advancements in technology. While segmenting the market with respect to number of leads the 3-6 lead segment had the largest market share followed by the 12 lead segment. The 3-6 lead segment is also expected to grow at the fastest pace in the forecast period from 2013 to 2020. More number of leads captures more signals, thereby giving a detailed outlook. This makes it easier for providers to better interpret the electrical activity of the heart. Thus, 3–6 lead and 12-lead ECG device segments will grow at higher CAGRs than single-lead ECG devices. With respect to the end users, the global diagnostic ECG market is divided into hospitals, home/ambulatory care research centers, diagnostic centers, rehabilitation centers, clinics, physician offices, and surgical centers. The hospital segment will observe a high growth due to the new technologies launched and the purchasing of an entire new suit of diagnostic ECG devices. The geographic analysis reveals that North America accounted for the largest share in 2013. APAC, on the other hand will be the main focus of the market in the coming five years that will register a high growth rate for all the segments. Europe on the other hand will register a slow growth rate in the forecast period. The key players in the ECG devices market are GE Healthcare (U.K.), Philips Healthcare (Netherlands), Mindray Medical (China), Mortara Instrument Inc. (U.S.), Spacelabs Healthcare (U.S), Schiller AG (Switzerland), Cardionet (U.S.), Compumed Inc. (U.S.), Nihon Kohden Corporation (Japan), and Welch Allyn (U.S.).